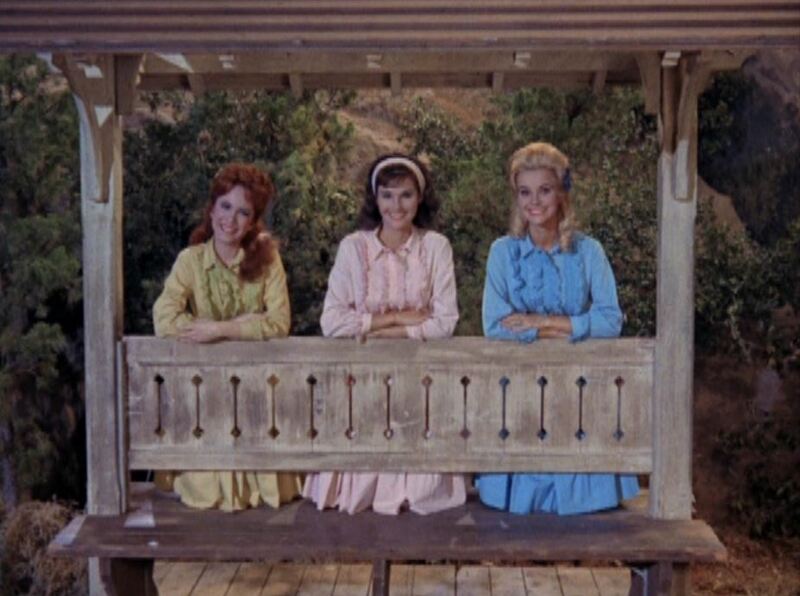 My all-time favorite railroad-themed TV show was/is Petticoat Junction. While not a movie per se, P.J. is old enough to be ancient history to a lot of people. 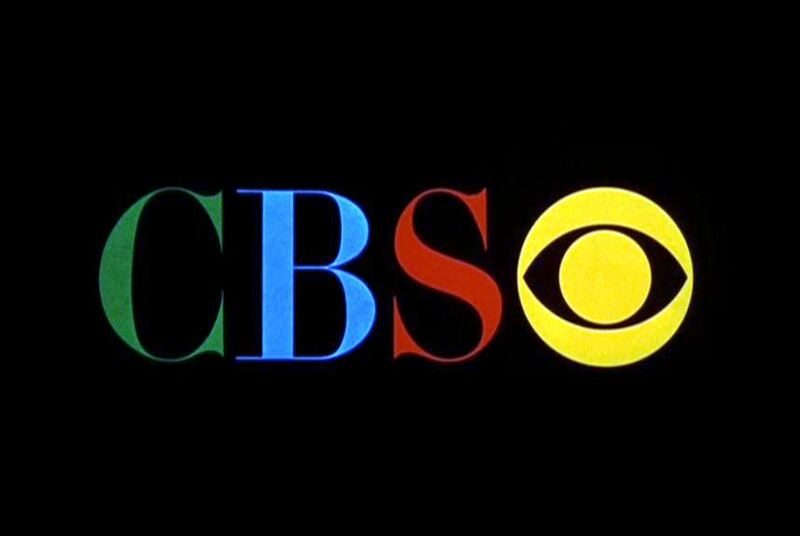 Color finally arrived with the third season (1965-66). 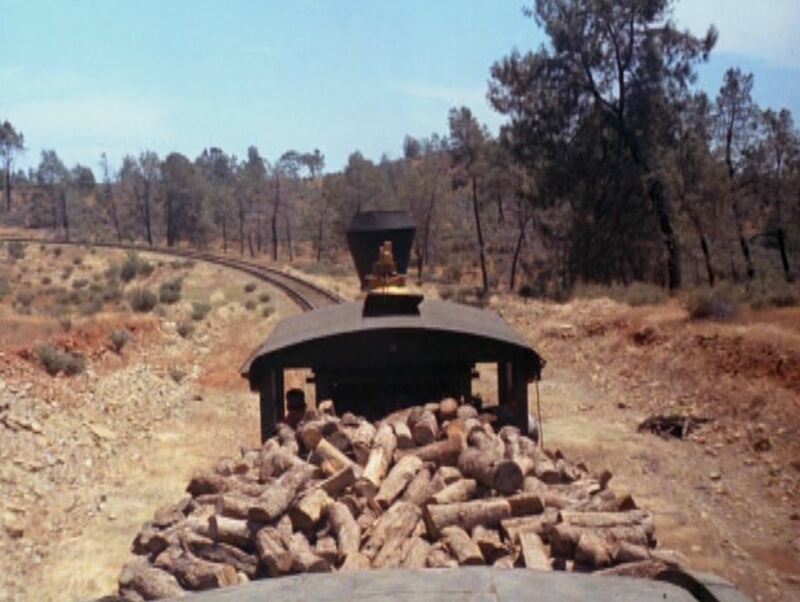 This sent filmmakers scrambling back to Jamestown, California to re-film all the live train scenes of Sierra Railroad 4-6-0 #3 and “shorty” baggage/coach #5. 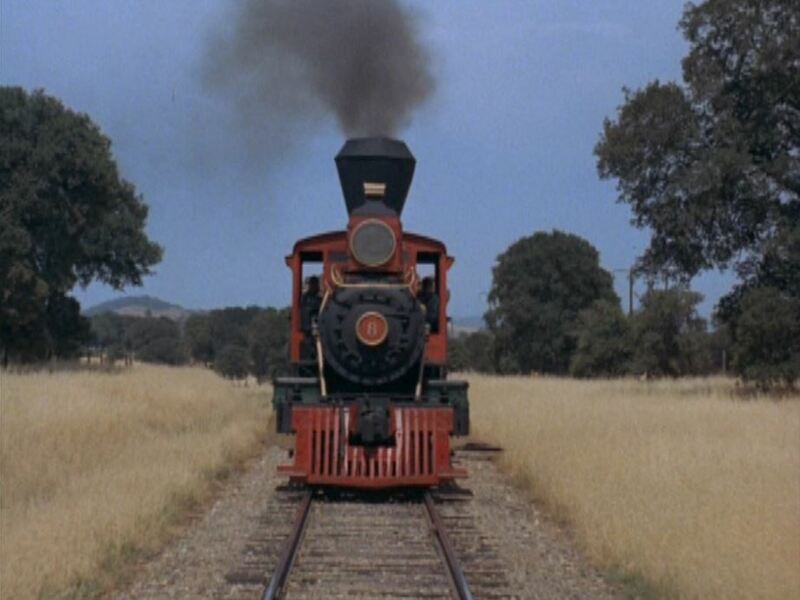 I selected “Bedloe’s Successor” (Season Three, Episode 11) as a typical show, but borrowed train shots from other episodes on my DVD set. 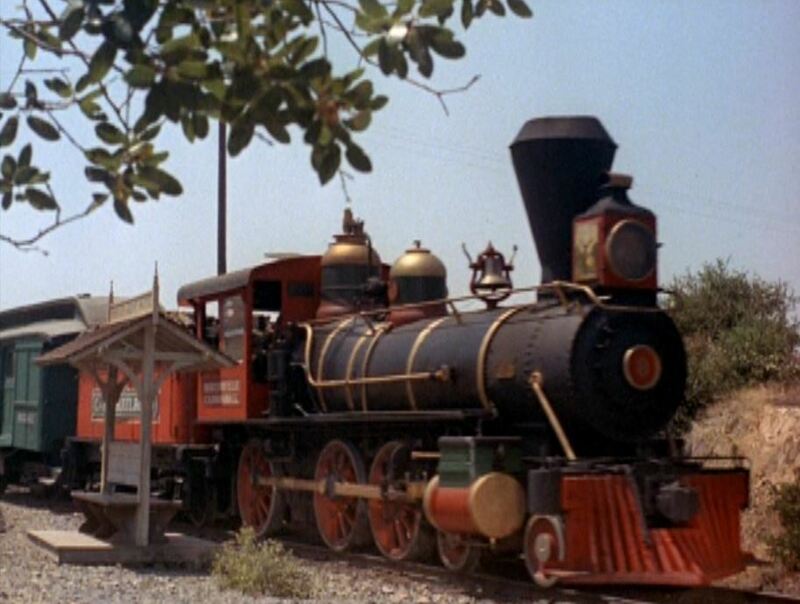 So let’s “come ride the little train that is rolling down the tracks to the junction”! 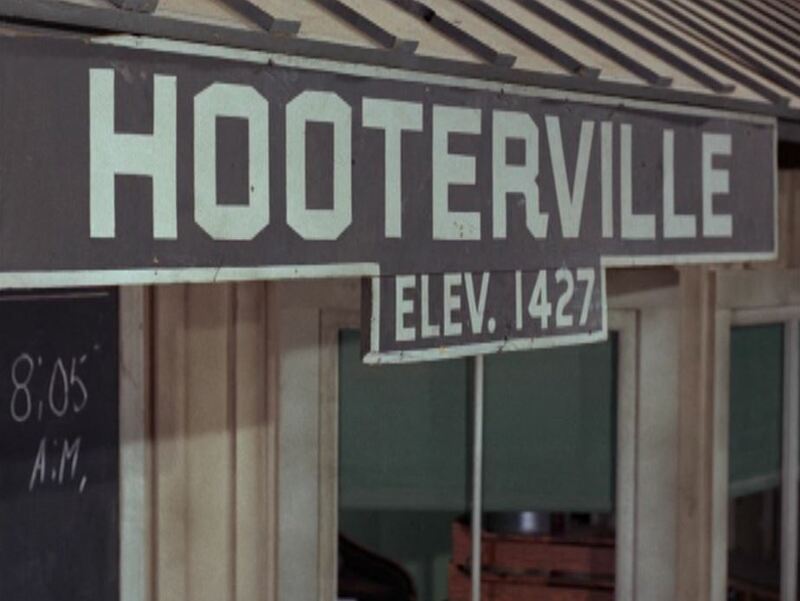 The Hooterville Cannonball rumbles towards the camera from episode 14, (What’s A Trajectory?). 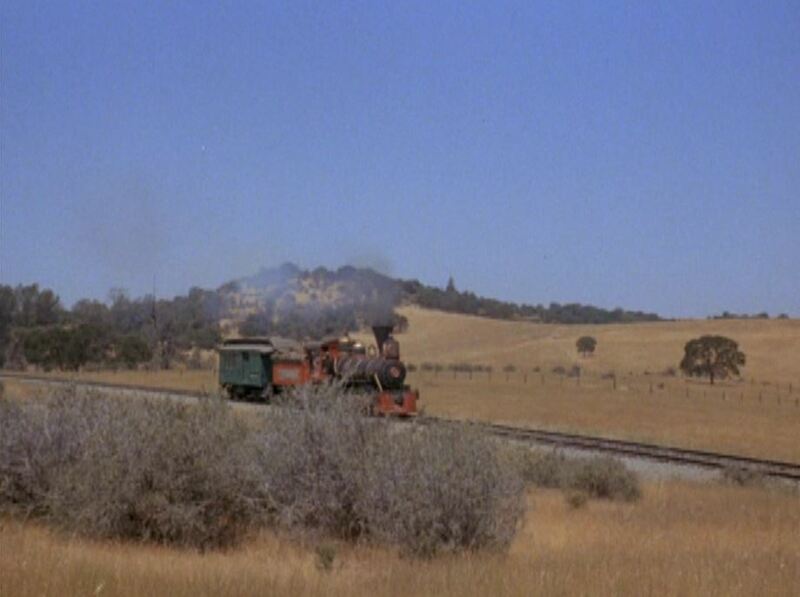 I’m guessing the locomotive was numbered #8 so it would view the same if the film happened to be reversed. 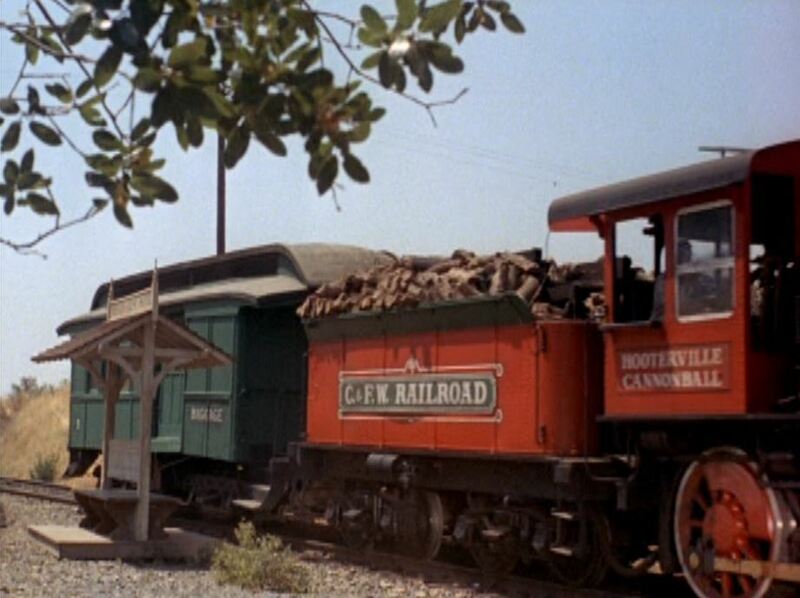 From the opening credits, the Hooterville Cannonball rounds a curve and past the camera; view from the tender into the cab. Despite all the wood present, Sierra #3 was/is an oil burner. 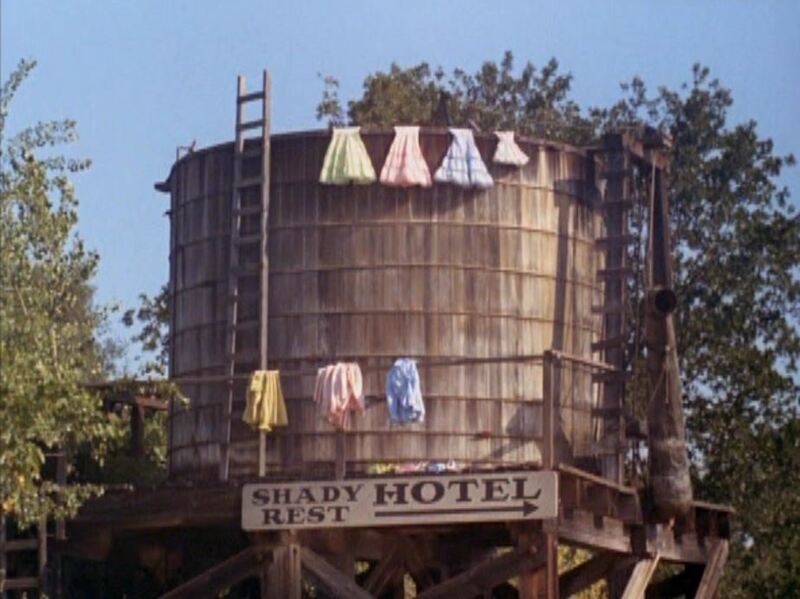 The water tank at the stop for the Shady Rest Hotel; Skinny dipping in the tank are Betty Jo (Linda Kaye Henning), Bobbie Jo (Lori Saunders), Billie Joe (Gunilla Hutton) and “Dog” (Higgins). Now fully clothed, the gals peer down the track to see the approaching train; the Cannonball pulls up to the little shelter at the Shady Rest. 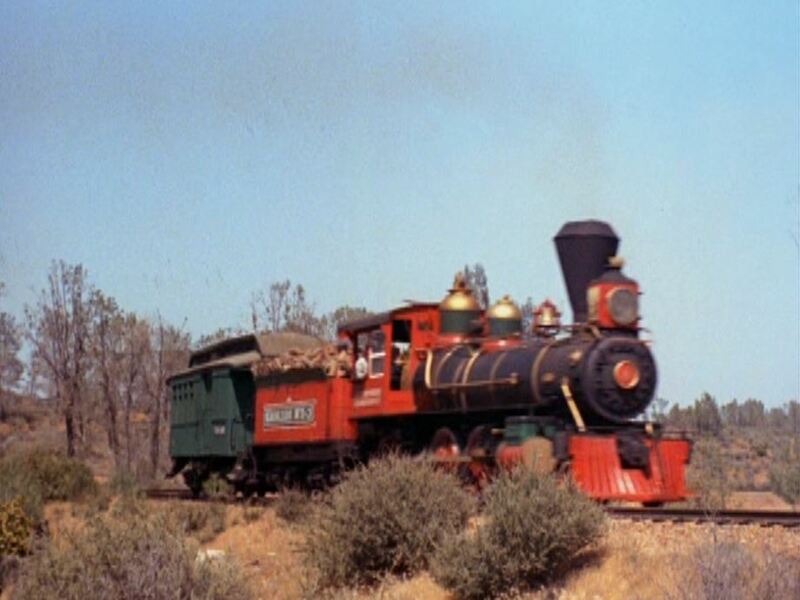 Episode 10 (Betty Jo Goes to New York) shows a different view of the Cannonball and train pulling up to the Shady Rest. We get a clear view of “C. & F. W. Railroad” on a board attached to the tender. From a little googling, it is apparent that no one knows what the C. & F. W. stands for. Chicago & Fort Worth? Your guess is as good as mine. Gah! It’s Homer Bedloe! (Charles Lane). 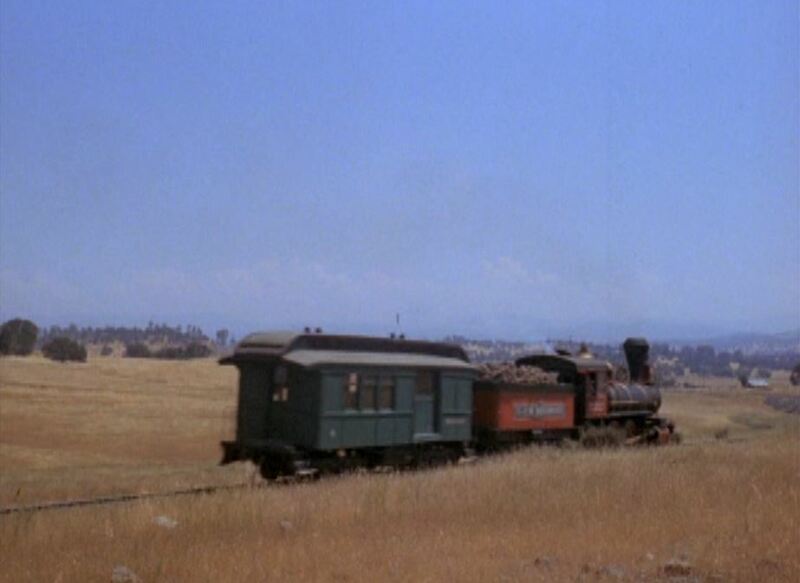 The Vice President of the C. & F. W. Railroad has arrived at the Shady Rest in disgrace. Fired from his position due to numerous attempts to shut down the Cannonball, he meekly asks for a place to stay. 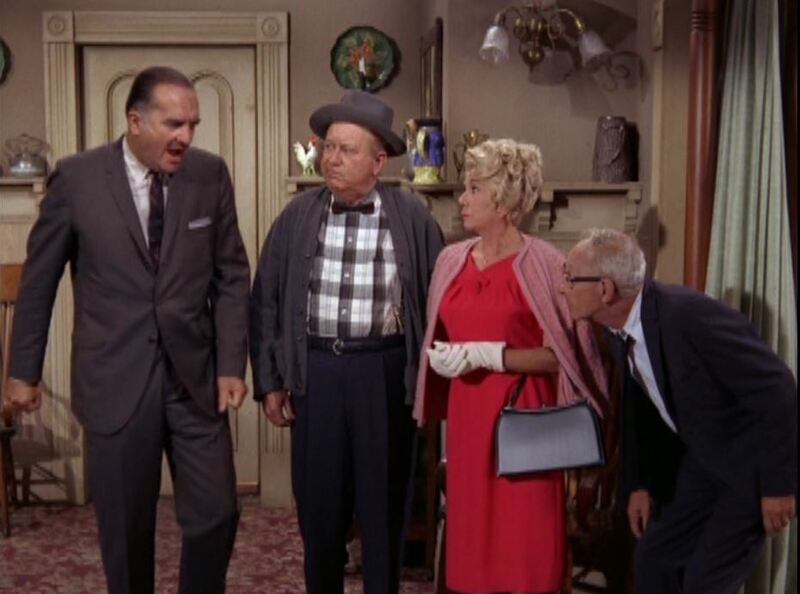 Shortly thereafter, Wilbur Goodfellow (Donald Curtis) appears on the scene, (as Bedloe’s Successor, get it? ), brandishing a newspaper which announces the ouster of Bedloe. 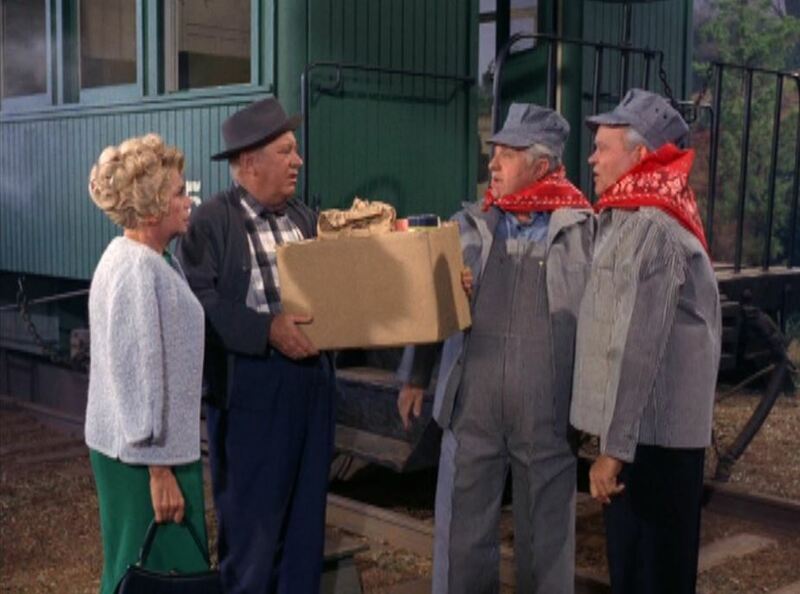 Some of the improvements Goodfellow announces include new uniforms for Engineer Charley Pratt (Smiley Burnette) and Conductor Floyd Smoot (Rufe Davis). The clothing is starched so stiffly, the men have trouble moving. 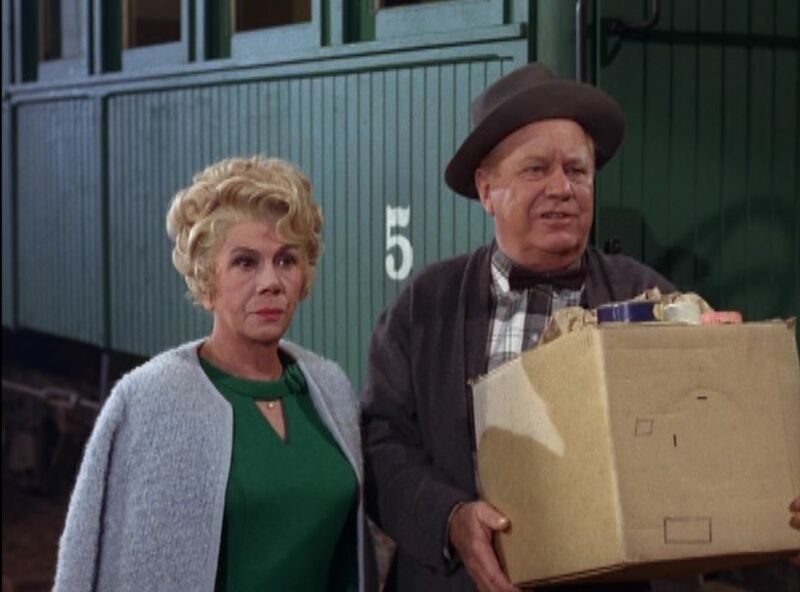 Behind Kate Bradley (Bea Benaderet) and Uncle Joe (Edgar Buchanan) we get a good view of the Hollywood-made mock-up of combine #5. View of the mockup of C&FW #8 from episode 13 (Uncle Joe plays Post Office); detail shot of the Cannonball’s front end — note the painting of an antlered elk on the side of the headlight box. 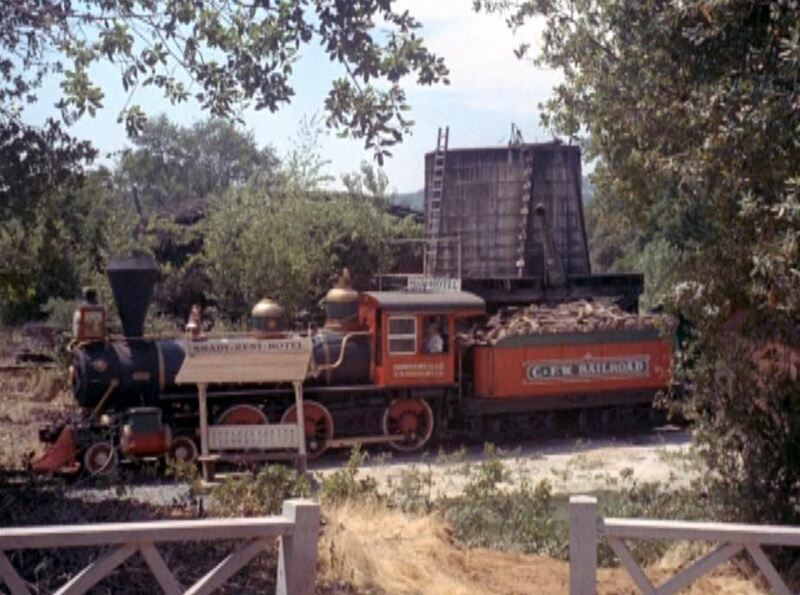 The history of the studio recreation of the Cannonball locomotive is kind of interesting. 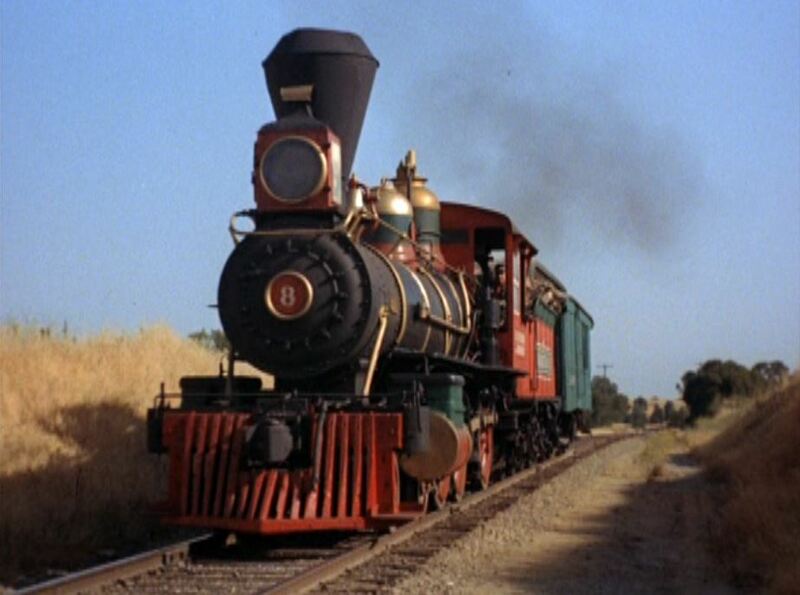 It was originally created as a replica of Rio Grande Southern 2-8-0 #20, the Emma Sweeny in the 1950 movie “A Ticket to Tomahawk“. 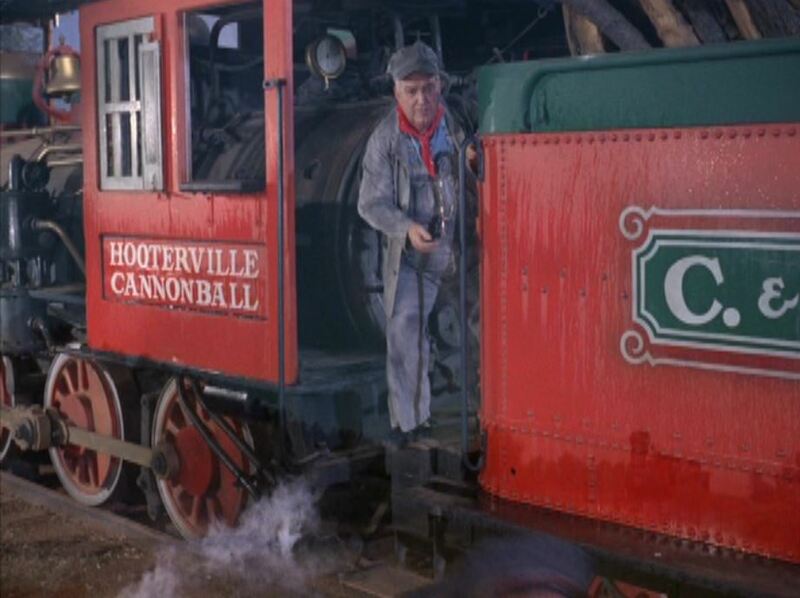 When Petticoat Junction began filming, the replica locomotive, now owned by an Oregon businessman, was leased by the studio for filming as the Hooterville Cannonball. There are excellent articles about the mock-up engine HERE and HERE. 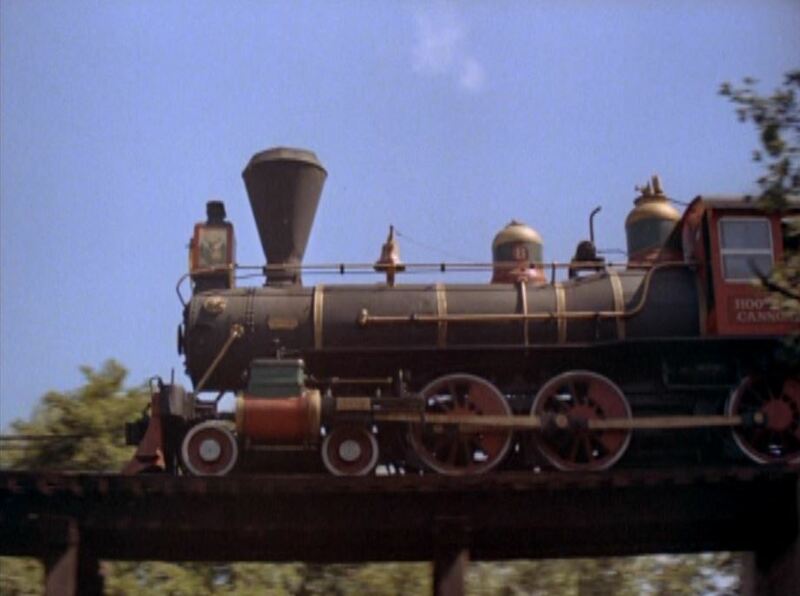 A bridge scene (literally) of the Hooterville Cannonball crossing a wood trestle. 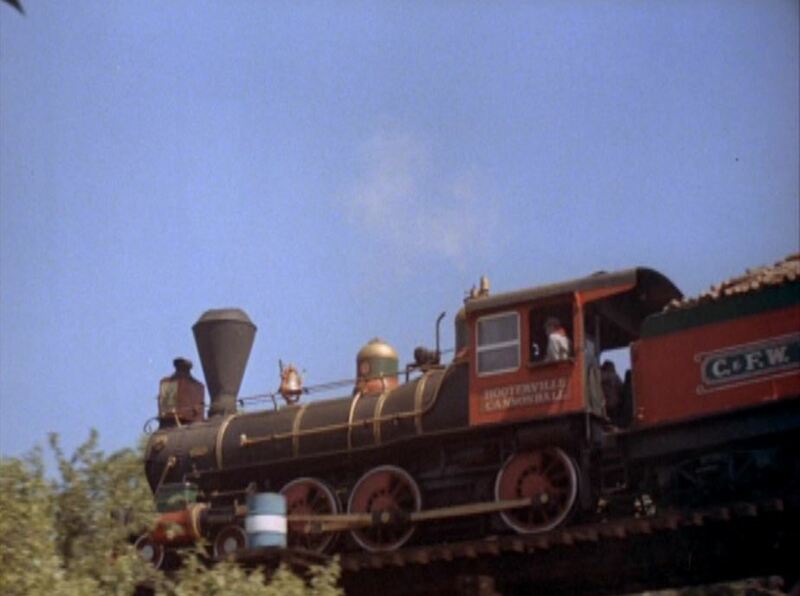 In another bridge scene from episode 10 (Betty Jo Goes to New York) the little train comes and goes through rolling grasslands. To complete the deception of Bedloe’s fall from grace, here we see him cowering behind Kate’s skirt as he is confronted by his supposed replacement. It’s just a ruse. 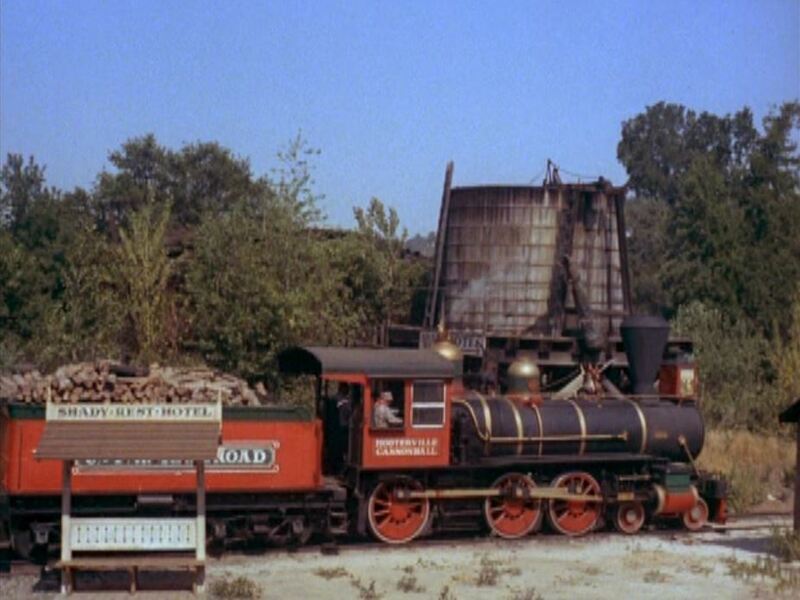 Bedloe really wants to send the Cannonball in for “rebuilding”, only to have it scrapped; Nice view of the Hooterville station sign. It’s difficult to see in this picture, but arrival of the Cannonball is 7:45pm and departure is 8:05am. 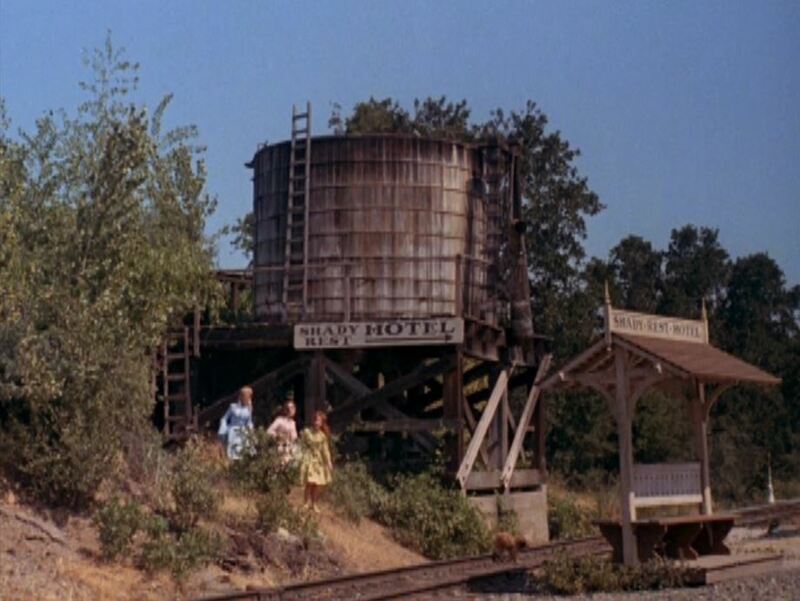 A reverse view of the Hooterville Cannonball at the Shady Rest stop from episode 13 (Uncle Joe plays Post Office). 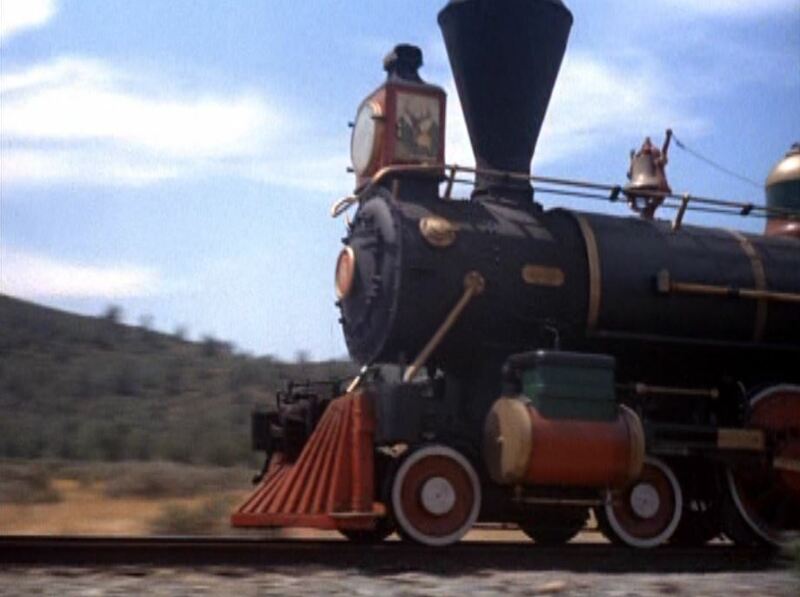 Here we get a good side view of the #5 baggage-coach. …..aaaaand the credits roll. Once more, the three gals from the Shady Rest dress up the scene. 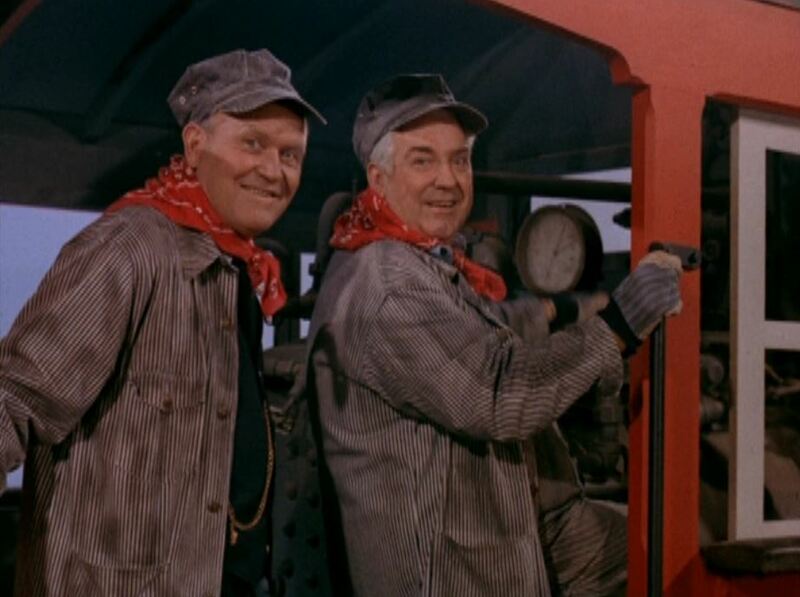 Rufe and Smiley pose in the cab of the C. & F. W. #8 replica. 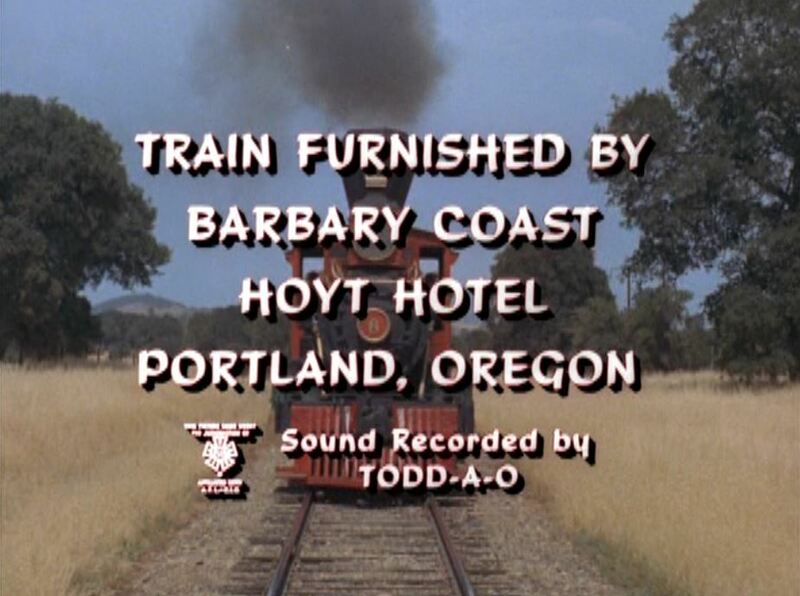 #8 rolls towards the camera and the final screen credit which also has an interesting history HERE and HERE. So far, Season 3 are the only color episodes released on DVD. Seasons 4 through 7 had a lot more musical numbers and I’m wondering if obtaining the rights to the music is holding up release. 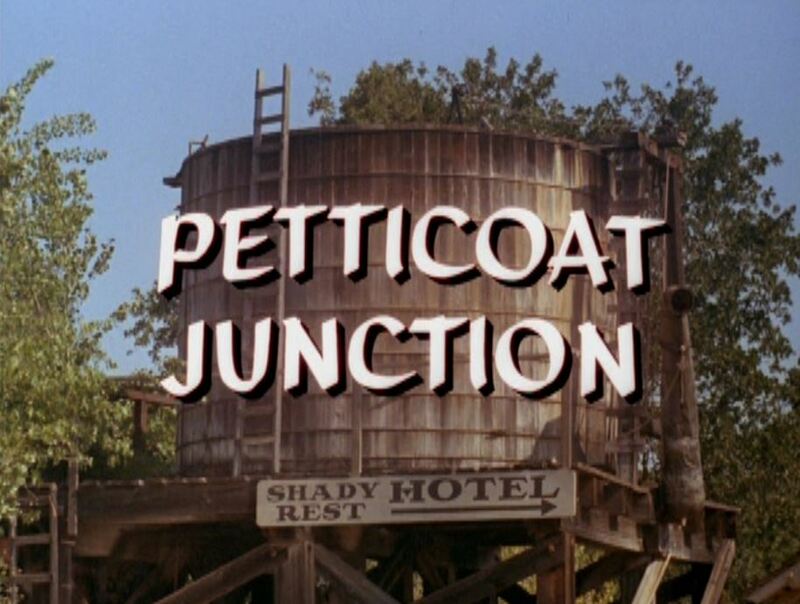 Anyways, Petticoat Junction is still available to view on MeTV and other places. Sierra #3 was recently rebuilt in 2010 and is currently in operable condition. 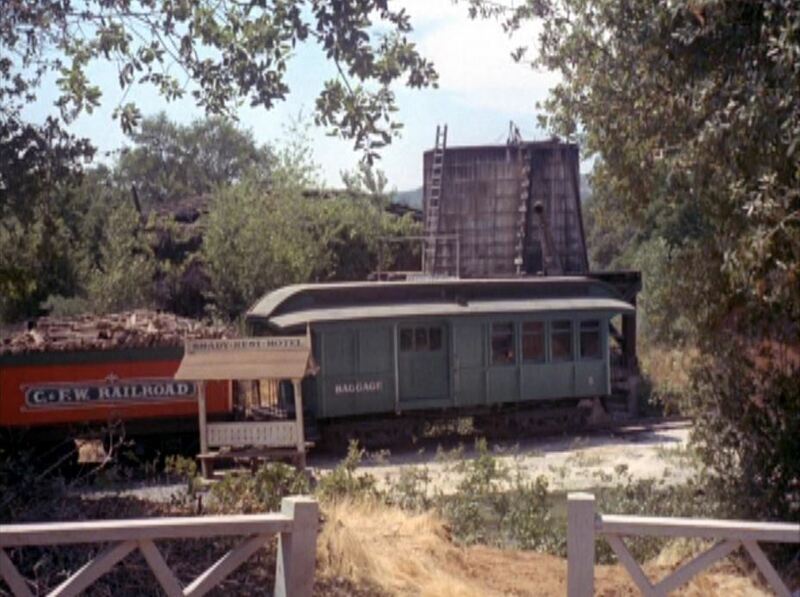 This entry was posted in Uncategorized and tagged A Ticket to Tomahawk, Bea Benaderet, Bedloe's Successor 1965, C. & F. W. Railroad, California, Charles Lane, Columbia Broadcasting System, Edgar Buchanan, Emma Sweeny, Filmways Television, Gunilla Hutton, Higgins, Hooterville Cannonball, Hoyt Hotel, Jamestown, Linda Kaye Henning, Lori Sanders, Petticoat Junction, Rufe Davis, Shady Rest Hotel, Sierra Railroad, Sierra Railroad #3, Smiley Burnette. Bookmark the permalink. Just for fun. Have a good Labor Day. 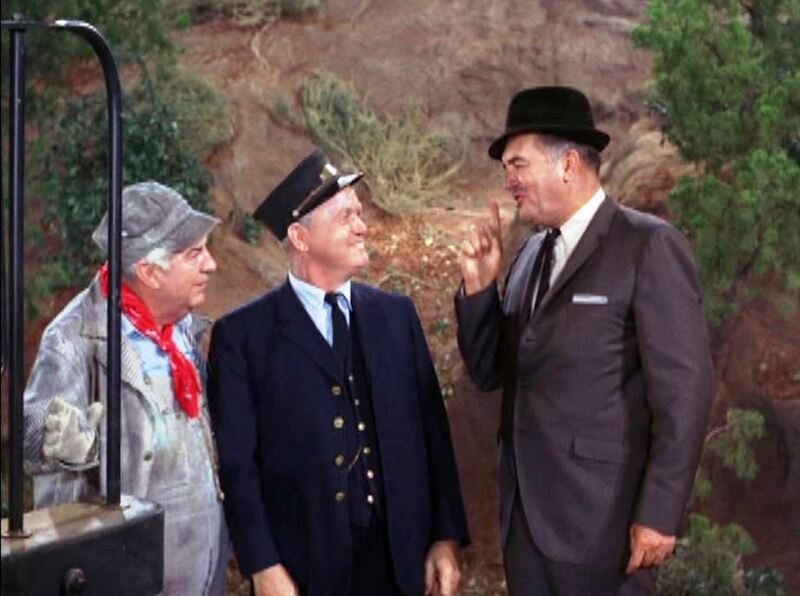 Homer Bedloe is also the bad banker MacGuire who tries to foreclose on the widow in F Troop, HA! 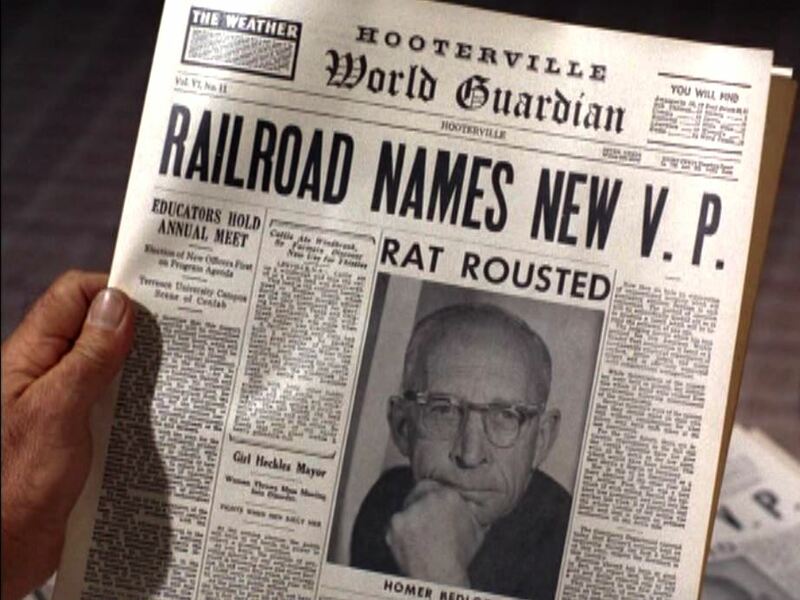 Character actor Charles Lane lived to 102 (2007) with 370 movie/tv credits.(IMDB). 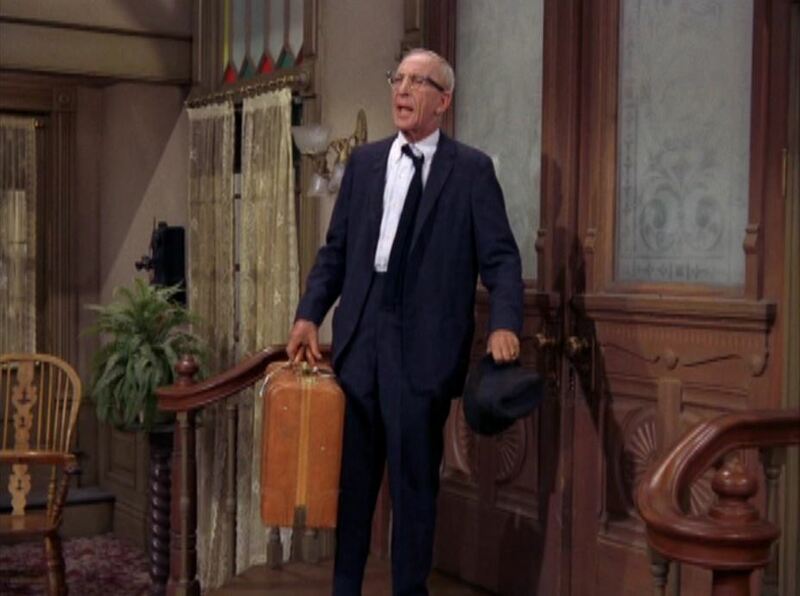 Played the Ricardo’s business manager in I Love Lucy in the same style. Wasn’t it fun though watching Kate&the girls foil Bedloe at every turn.